While studying at the university, street foods were my easy-to-go meal during the break between morning and afternoon classes. There were numerous food carts around the campus and the ‘mamas’ (the food vendors) had always been fast in preparing their delicious food items. I was a regular consumer of their foods. There were numerous restaurants in the adjacent areas but I used to depend on the food carts as they were enough to satiate my hunger and save my pocket as well. I was not sure whether the foods served in the restaurants were hygienic or not, but those foods were expensive in comparison to the street foods. When I visited restaurants I had to pay additional money as VAT which imposed an extra pressure on my wallet. Considering all these hassles it was more convenient for me to take lunch with a bunch of friends by standing under a wide banyan tree. And it was not only the case for me rather many people have similar experience. Dhaka’s street foods have always been popular for their amazing taste and wide range of varieties. Besides, easy accessibility, low price and pre-cooked items have made street foods a preferred option for the foodies. Dhaka is the most populous city of the country where throughout the day maximum people remain busy with their works. In the mid of their hectic work schedule people hardly can manage time to go home or restaurant for completing their breakfast, lunch and dinner. Moreover excessive price of restaurant foods don’t encourage them to visit those places on a regular basis. That is why the city dwellers, particularly the working-class people and students, have found a way to satiate their hunger through street foods. Street foods of Dhaka are appreciated for their unique flavors. Their wide range of varieties including all sorts of fried items and kebabs, fuchka, chotpoti, khichuri, tehari and burger always attract the foodies. Jhal muri, a spicy mixture of puffed rice, chanachur, gravy and mustard oil, is one of the most popular street food items of Bangladesh. Besides, Dhaka’s street food lovers are fond of the combination of spicy, sour and sweet taste of crunchy fuchka and mouth-watering chotpoti. Halim is another preferred choice for them. This traditional dish that originated in the Middle East is cooked and served in our own style. 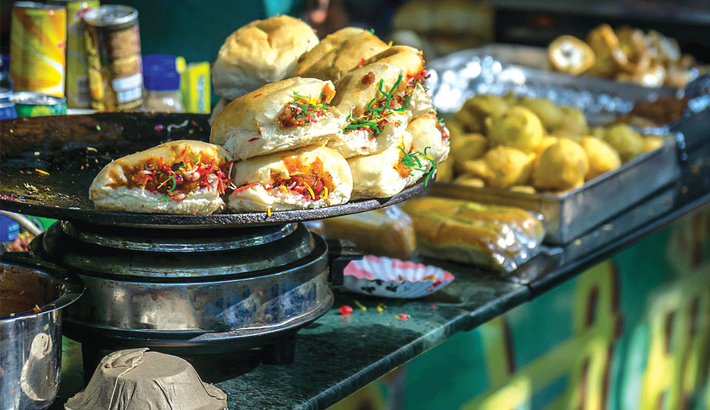 Street food lovers of this mega city enjoy delicious taste of small-shaped kebabs made of beef or mutton which are displayed with egg chops, roll and parathas in the street-side food cart. When these items are presented with a few pieces of raw or fried onions and a plate of mixed salad or sauce Dhaka’s foodies cannot but devour them after a busy day. According to the world population review 2016, the population of Dhaka city is 18.237 million. It is one of the most densely populated cities of the world with a density of 23,234 people per square kilometer. Millions of people daily consume numerous types of street foods from street vendors as these foods are relatively cheap and easily accessible. Almost every neighboring road of a busy area has several street food vendors. Apart from the tea stalls and food carts, many food vendors roam around the city with their basket full of foods. So it is difficult to count exact number of street food vendors in Dhaka. But it is for sure that street food business is generating a huge number of employment opportunities for a significant group of people who would otherwise be sitting idle without adequate chance of employment. Moreover street foods are playing an important role in meeting the demands of the Dhaka dwellers albeit there are some negative discussions such as many food safety experts opine that street foods are unhygienic. The water used to prepare such food is contaminated and ingredients of these food items are not preserved properly. And these allegations seem true in most of cases as the street food vendors cannot maintain hygiene while preparing them and these foods are cooked and served in open and dusty places. Monitoring the quality of street foods is always a difficult task as it is virtually impossible to observe the activities of so many people at a time. Thus unhygienic and unsafe street foods pose great threat to public health. But it is hard to take serious action against the street food vendors (who are involved in producing unhygienic foods) ignoring their economic struggle and the demand of street foods among a vast number of consumers. There is another side of the story as well. There is no rule or policy in our country to facilitate street entrepreneurs and establish the rights of street vendors. Thus street food vendors and hawkers often need to face annoying situation in Dhaka. Their business is often interrupted by the extortionists and political goons. And sometimes a group of unscrupulous law enforcement agency members also harass them. These issues should be addressed by the concerned authorities. Street foods are satisfying the appetite of millions of city dwellers every day and street food business has created a huge number of small entrepreneurs in the country. But unfortunately it has not achieved any recognition and remained only as an informal sector. Due to the huge popularity of such foods a separate market has developed. This is the right time for the concerned ministries to come up and bring a guideline for this booming business. Problems of this sector must be resolved. Meanwhile the government will have to understand that if they arrange training programme on hygienic cooking, provide legal place and easy loan facilities to the street vendors before taking any hard line against them, it would continue the supply chain of foods for the people of a certain class and facilitate an underprivileged section of entrepreneurs as well.